TOM Hutchison will line up for his first Chicago Marathon on Sunday with a real spring in his step and optimistic of giving himself a belated birthday present. 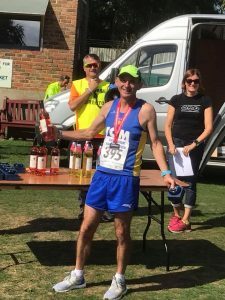 The Team Bath AC runner joined the M65 masters age group last week when he celebrated his 65th birthday and that more than anything gave him an extra incentive to make his mark in one of the world’s greatest marathons. The presence of four-times Olympic champion Mo Farah will ensure plenty of British interest in the event this year but Hutchison’s Team Bath colleagues and friends will be watching closely how he fares after an excellent build-up. “I have been working really hard for this race and have lost some weight as well,” said Hutchison. “I also ran my fastest Parkrun for three years on Saturday when I ran 20mins 10secs in the Bath Skyline event and I was really pleased with that. Hutchison has been working hard with club coach Paul King to take full advantage of moving into the new age group and has mapped out a clear plan for the next 12 months. “I will run the Manchester marathon in the spring of 2019 because the top five finishers there will get an England Masters vest at the Vale of York marathon in October,” added Hutchison. As for this weekend Hutchison firstly will be hoping the weather conditions are more benign than on his last marathon in America when he became hypothermic as the Boston Marathon in April suffered some of its worst weather in living memory with torrential rain at close to freezing temperature. Doggedly Hutchison finished the race despite running into big problems but had to receive medical attention as he recorded a personal worst time of 3hrs 50mins. He is far better prepared for Chicago so is confident of producing a performance that reflects that. “I am looking for a reasonable time of around 3hrs 15mins and I would be very happy with that,” said Hutchison. To put that into perspective the quickest marathon time this year by a British runner aged 65 is Poole Runners’ Dave Cartwright with 3hrs 13mins 25secs followed by John Woodnutt (3:18.48) and Ged Ruffle (3:19.08) so Hutchison is setting his sights high in America’s Windy City.